Pat McCabe is proud to be a blood biker. No, he’s not a member of some sinister Hell’s Angels gang, though many might describe him as an angel. He’s the founder of Blood Bike East, part of a nationwide group of altruistic motorcyclists who provide an invaluable, and wholly voluntary, service to the country’s hospitals and medical facilities. Acting as a free medical courier service, the bikers are on call from 7pm to 7am weeknights and all day weekends and bank holidays, their cargo ranging from blood being transported to a facility for testing, to scans, x-rays and patient reports. They also transport breast milk for the Irvinestown Human Milk Bank (see last issue). “If it fits on a bike we’ll move it for nothing,” McCabe proudly boasts. Blood Bikes have been operating in the UK since the 1960s but are a recent phenomenon here. 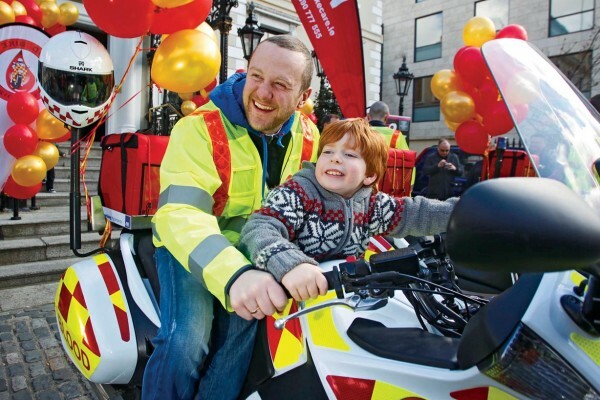 McCabe had been aware of the concept and when he met a Galway biker who was setting up the country’s first Blood Bike outfit on the west coast, he decided to form Blood Bike East. He put out a call for volunteers on various internet biking forums and received an enthusiastic response. A committee was formed in October 2012 and Blood Bike East was officially launched in April 2013. Over 300 runs were made by the organisation between April and December, with close to 100 members registered. Volunteers must pass a strict set of criteria to become a blood biker and current members range in age from 26 to a retiree in his late sixties, across both genders. At any time there are four bikers on call, operating two separate rosters; one for Dublin hospitals and one for those further afield. Often the bikers are required to journey halfway across the country, passing their cargo to a member from the likes of Galway and Donegal. Blood bikes are saving lives, and also a considerable sum of money, providing an entirely free service that would otherwise prove costly. McCabe points out that, unlike many charities, his volunteers don’t receive any personal financial rewards. “All our donations come from shaking buckets in shopping centres and the odd contribution from a benefactor,” he says. Pictured at the launch of Blood Bike East is comedian and motorcycle enthusiast, PJ Gallagher with Thomas Fegan (8) from Killiney. Photo courtesy of Blood Bike East.